The above mindmap is illuatrative of the ocean processes that are important for climate, particularly in the North Atlantic, and hence need to be well simulated by our models. The Gulf Stream is an example of a oceanic western boundary current, in which warm water of tropical origin is drawn northwards in a narrow current (typically 100km or less wide), and hence transports heat from equator to pole. It is an important element of the North Atlantic ocean circulation, and helps keep western Europe milder than the equivalent latitude on the North American coast. 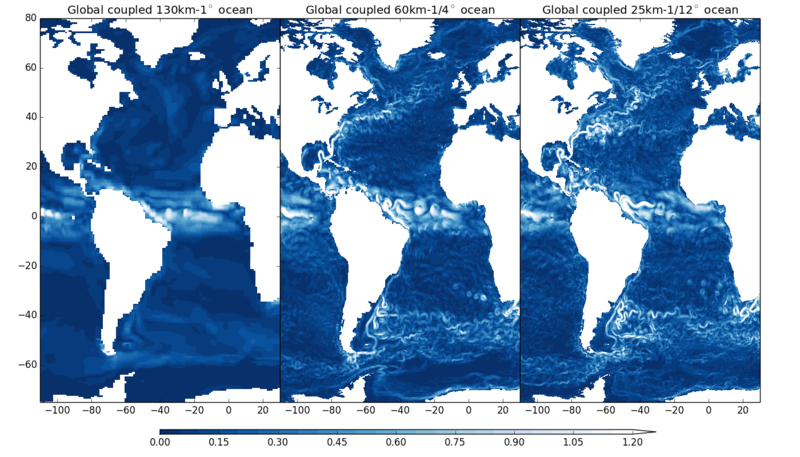 Due to its narrowless, it is poorly represented in low resolution models (with resolutions of 100km or lower, see https://www.primavera-h2020.eu/primavera/static/media/uploads/Showcased/ocean_current_cmip6_snapshot_resol_atl.png), and hence it is of interest how better representation may impact climate variability (and change). The AMOC is the circulation that brings warm, near-surface water from the tropics to the northern North Atlantic and Arctic, where it is transformed by surface fluxes into colder and more dense water, which sinks and flows equatorward at depth. The Gulf Stream (above) is the near surface component of this circulation. The representation of AMOC in models can vary widely (as seen in CMIP3, CMIP5), even when the same ocean model is used with different atmosphere models. The AMOC is also associated with northward heat transport, and will depend on the deep water formation that is simulated by models. The ocean transports large amounts of heat to the north, mainly within the Gulf Stream – North Atlantic Current system. Increasing the oceanic resolution is leading to an increased northward ocean heat transport with leads to higher surface temperature in the North Atlantic and increased heat loss to the atmosphere. The ocean heat transport is also important for the Arctic sea ice and variations in the heat trasnport strongly govern variations in sea ice volume and extent in the North Atlantic section of the Arctic. Increasing ocean heat transport into the Arctic with higher ocean resolution is the main reason for reduced sea ice extent in the Barents Sea region. Freshwater has a lower density than saline water and affects the mixing in the ocean and is important for the large scale oceanic circulation. Export of sea ice and liquid freshwater out of the Arctic constitutes the major source of freshwater input for the North Atlantic Ocean and is affecting deep water formation in the Labrador and Nordic Seas. The most prominent examples for this, are the so called Great Salinity Anomalies in the Labrador Sea, where large sea ice exports through the Fram Strait and further propagation in the East Greenland Current into the Labrador Sea suppressed deep convection in the Labrador Sea for several years. Most of the freshwater is transported in a small current near the coast, something which is not well represented by low resolution models. The North Atlantic is the region of the world where most of the deep waters of the global oceans are formed. Particularly, in the Labrador Sea and the Greenland Sea, strong surface heat fluxes from the ocean to the atmosphere cool the suface water masses, increase their density and the dense water sinks downwards into the deep ocean. This formation of deep water masses is a major contributor to the global thermohaline circulation and the Atlantic Meridional Overturning Circulation. Despite its global importance, many climate models are not able to realistically simulate the deep water formation. Increasing the resolution affects the deep water formation through differences in the ocean to atmosphere heat release but also through a more realistic position of ocenic currents. The ocean currents transport cold and fresh water southwards out of the Arctic and warm and saline water northwards in the North Atlantic Current and affect the ocean surface conditions in the convections regions. Western boundary currents, such as the Gulf stream, are characterized by strong SST gradients. Along these gradients strong fluxes occur and are regions regions of storm development. A correct representation of these these SST gradients is therefore important for mid-latitude weather and climate. Climate models, due to their coarse resolution, underestimate those gradients with impact for their representation of the storm tracks. In addition due the coarse resolution of ocean models also the geographical position of the currents is displaced with respect to observations. Analyses of PRIMAVERA models reveals that increasing the resolution 0.25 for the ocean and 50 km for the atmosphere significantly improves the representation of the SST gradients. Strong air-sea coupling occurs along the western boundary currents such as the Gulf stream. PRIMAVERA models show that enhanced ocean as well as atmosphere resolution increases the ocean-atmosphere coupling due to better resolving the SST gradients. This is a key area for PRIMAVERA to look at how model horizontal resolution can affect (and hopefully improve) some long-standing climate model biases. The paper by Vanniere et al. (2019) shows this for precipitation using a range of models and resolutions, and we are gradually expanding this idea to other variables. The aim is to identify biases common to many models, and suggest ways that these can be improved in future model development, which is an aspect that our Model Development Work Package 3 has been progressing. SST-gradients: Western boundary currents, such as the Gulf stream, are characterized by strong SST gradients. Along these gradients strong fluxes occur and are regions regions of storm development. A correct representation of these these SST gradients is therefore important for mid-latitude weather and climate. Climate models, due to their coarse resolution, underestimate those gradients with impact for their representation of the storm tracks. In addition due the coarse resolution of ocean models also the geographical position of the currents is displaced with respect to observations. Analyses of PRIMAVERA models reveals that increasing the resolution 0.25 for the ocean and 50 km for the atmosphere significantly improves the representation of the SST gradients.